Salt Lake’s food-truck scene is revving up big time. From Asian fusion to burgers, from cupcakes to coffee, these mobile food purveyors are redefining and revolutionizing on-the-go eats in Utah. Six vegan-friendly trucks gathered over October 6th weekend in Salt Lake City for Utah’s first-ever Vegan Food Truck Round-Up. The food truck event served everything from vegan hot dogs and nachos to falafel and churros in and around The Reverstaurant, 329 E. 300 South, where guests ordered outside, but could eat inside. Participating trucks were Chiquitos Churros, Falafel Tree, Gerlach’s, Ginger’s and Poutine Your Mouth. 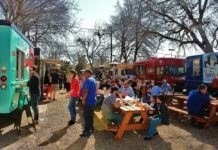 The event took place in the newly established Food Truck Garden—the city’s only permanent food truck court—near the eatery Reverstaurant, where guests had the option of dining inside. A portion of the proceeds from the event went to benefit local nonprofit Ching Farm Animal Rescue and Sanctuary. Food Truck Thursdays at the downtown Gallivan Center offers a perfect solution for diverse dining needs. Each Thursday, many of Salt Lake’s food trucks gather from 11 a.m. to 2 p.m. near Gallivan Plaza to serve a medley of mouth-watering lunch options. Salt Lake’s Granary Row, a pop-up market and festival space located in the Granary District, hosts food trucks every Thursday, Friday, and Saturday night in the summer and fall from 6 – 11 p.m. A number of Salt Lake’s food trucks set up shop to offer dinner and entertainment.